For our regular readers and followers on various social media, we’ve started a series of giveaways! Our previous giveaway was for September 2018. Here are quick links to our previous giveaways. 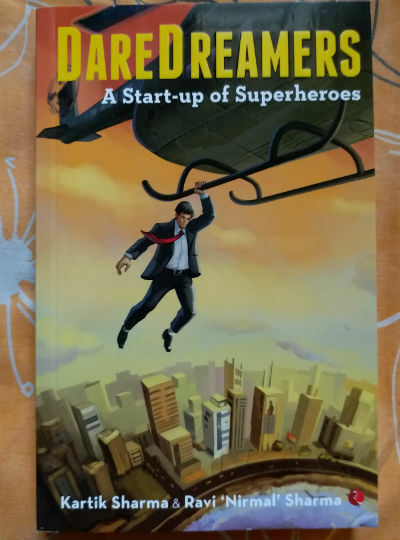 You can stand a chance to win a book named Daredreamers: A Start-up of Superheroes by Kartik Sharma and Ravi Nirmal Sharma. We are making it very simple for the participants. The following are the points you need to follow/remember to take part in this giveaway. The contest will run from October 01, 2018 to October 31, 2018 IST, which is referred below as the “contest period” or “giveaway period” or simply “the period”. You need to subscribe our newsletter during giveaway period. During newsletter subscription, you need to share real details. Please post a comment below, answering, why you are excited about this book? and Why you like Thinkerviews? The winner will be chosen based on the best answer and when there are more than one interesting answers, we will pick one of them randomly. The decision of ThinnkerViews team will be final and cannot be challenged in anyway. If you are already our follower on any social media, you cannot unfollow – and then follow again to be part of this contest. Simply, follow the rest of the steps, and you will be eligible for the giveaway. Providing wrong details / not following any of the rules, will make you disqualified for the giveaway. We reserve the right to change any rule of this giveaway anytime, including cancellation of the same. The results are expected to be announced by or on 15th November, 2018, but we reserve the rights to change the schedule of the same, if not canceled this giveaway. Please note that this giveaway is strictly for resident Indian Citizens with deliverable Indian postal address only. The winner(s) require to share a photograph of him/herself with the book, or at least the book upon its receipt. The winner(s) must allow us to share his/her name, city and social media handles (no other personal information) and the photograph mentioned above on our site/social media/any other promotional activities. It is just to add trustability and prove the genuineness of the giveaway. We encourage the winner(s) to share these details from his/her end on his/her social handles as well. So are you excited for this giveaway? All your suggestions are most welcome. We are planning to add one more book to this giveaway, so you better bookmark this page. And yes, if you have any suggestion in that regards (i.e. want to suggest a book, for example), please let us know, and we will try to do our best to include it. This contest is closed now. Though there is no clear winner for this month, just to spread the love for #Books and #Reading, we’ve decided to GiveAway a paperback copy of DareDreamers to one of our regular readers Sandeep Kumar Rana randomly. Congratulations Sandeep for winning the same, have a fantastic reading experience.